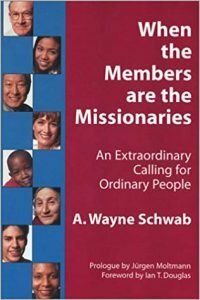 One of the ways the institution seduces the mission is by reducing it to the service and outreach of the congregation. How many formats there are for congregations to spend hours and hours figuring out what St. Paul’s – or whatever – will do to serve its community! [By the way, where to begin in community service can be done in only two meetings with field interviews in between to discover needs.] And then St. Paul’s will say, “Oh yes, for our mission to the community we run a shelter for troubled families and a Saturday hot lunch for the homeless.” All the while, the members never seem to see the 1/4 of the children without health care in their town or the thousands in their state who go to school hungry each day. They never seem to get around to exercising their citizenship, their vote, to do something about it! To put it another way, to center on body-mission is to leave out / overlook / ignore today’s most powerful change agents – the member-missions of the baptized! Even more seductive is the place given to “finding our mission as St. Paul’s.” After months of meetings and outside consultants, St. Paul’s – or whatever – usually ends up with embracing only one of the gathered church’s functions: “Our thing is music / education / social justice.” How sad to overlook what each of the baptized do to make life more loving and more just wherever they are all the time! Rethink it at least every two years. This is a key first step [for the second step see Basic Tools 9-Discerning each of my current daily missions and for the third see Basic Tools 10-Building a team to help me in each of my daily missions] in implementing member mission throughout a congregation. Agree on a vision or purpose statement that makes supporting the members in their daily living as Christians the central purpose – or among the central purposes – of the church. Then, step by step, begin connecting it with everything the congregation does. At St. John’s Episcopal Church in Essex, NY, we all share in God’s work of calling, forming, sending, and supporting Christians as agents of love, justice, and peace as shown through the life of Jesus Christ. We seek to live this way in every part of life: home, work, local community, wide world, leisure, and church. It has only been updated after a change in clergy leadership. Now, test it. Are each of the four essentials listed above either present or assumed? Assume you are the rector or pastor. You have the list of essentials. Take two-three minutes and each write your own. Two share; check off the notes we hear. This is the first step. Get it in the form that works for you and then put it before the official board or vestry to revise and make their own – with you.